Genuine White-Rodgers FR1400 media filter. Measures 16 x 26 x 5 inches. Merv 8, Type 100. 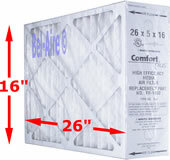 Replaces F825-0548. The ACM Series Media Air Filters are a big leap beyond standard air filters in cleaning the air in your home at up to 55% efficiency. The Comfort-Plus Merv 8 advanced filtration system removes household dust and animal dander from the air you breathe to keep your family healthier and home cleaner. Your health is directly affected by the quality of the air you breath. 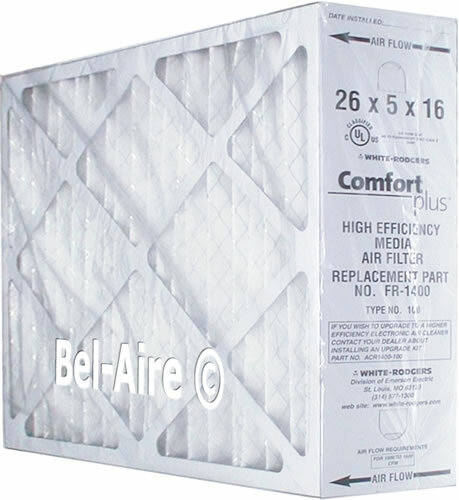 White-Rodgers Comfort Plus air cleaners remove many health harming airborne contaminants. The FR1400 filter can be used to replace the cells and prefilters in the SST1400 during cleaning. Disconnect power when using a filter in the SST.